It can cause Flinders Island spotted fever. ↑ Stenos J, Roux V, Walker D, Raoult D (October 1998). 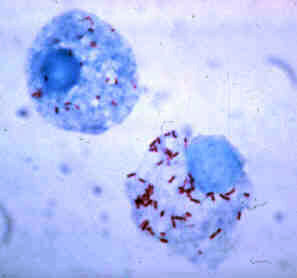 "Rickettsia honei sp. nov., the aetiological agent of Flinders Island spotted fever in Australia". Int. J. Syst. Bacteriol. 48 (4): 1399–404. doi:10.1099/00207713-48-4-1399. PMID 9828442. ↑ Unsworth NB, Stenos J, Graves SR, et al. (April 2007). "Flinders Island spotted fever rickettsioses caused by "marmionii" strain of Rickettsia honei, Eastern Australia". Emerging Infect. Dis. 13 (4): 566–73. doi:10.3201/eid1304.050087. PMC 2725950 . PMID 17553271. ↑ Xin D, El Karkouri K, Robert C, Raoult D, Fournier PE (August 2012). "Genomic comparison of Rickettsia honei strain RBT and other Rickettsia Species". J. Bacteriol. 194 (15): 4145. doi:10.1128/JB.00802-12. PMC 3416548 . PMID 22815457.